Green and yellow banners and balloons festooned the doorway of B&H Dairy on Wednesday night as it celebrated 80 years in the East Village. And the swarm of customers flooding the narrow hallway of the restaurant showed that the place had more than withstood the passage of time. While the Jewish patrons who frequented the diner in its early days may no longer be as strong of a presence in the East Village, this small diner with a medley of vegetarian/kosher/Eastern European fare and fewer than 30 seats (most of them classic lunch counter stools) has continued to soldier on throughout the decades, surviving economic downturns, a gas explosion and ongoing gentrification. Owner Fawzy Abdelwahed with a customer on Friday. (Photo: Jaime Cone). 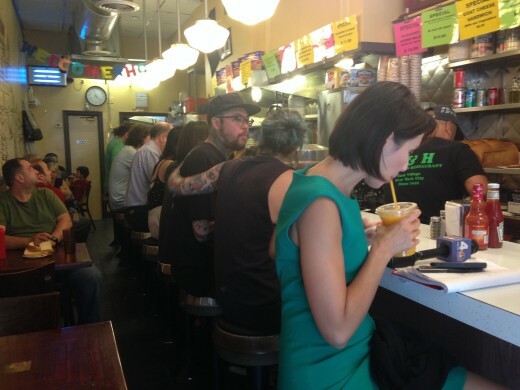 If you aren’t among the many kasha cravers who’ve flocked to B&H Dairy since its reopening Friday, here’s a fun chance to do so: Andy Reynolds, a neighbor who’s been managing the crowd-funding campaign for the East Village diner, tells us there’ll be a welcome-back party — complete with cakes, coffee and challah — this Friday from 6 p.m. to 8 p.m.
East Village residents were relieved to see that B&H Dairy, a fixture of the neighborhood, reopened this morning after being closed for several months because of the Second Avenue gas explosion. They crowded into the narrow diner, happy to once again sit down to a plate of the 76-year-old vegetarian restaurant’s Eastern European comfort food. A little over two months after the Second Avenue gas explosion, local politicians and a small group of community members toured the still-smarting small businesses around the blast site. This morning, outside of a shuttered B&H Dairy, owner Fawzy Abdelwahad stood waiting for Con Ed inspectors who were due to check his gas line. Since an explosion leveled three buildings a few doors down from him last week, he’s been working with various city agencies and his insurance company to reopen his 73-year-old diner and keep his business from going under.